Have you looked lately at the average WordPress Theme footer? That little bit of color and text at the bottom of a WordPress Theme? Lately, it seems that the only time it gets any attention is when people are looking for design credit, embedded links and ads, and other nasties. Sometimes I think the web designer puts so much energy into the rest of the Theme that they lose interest by the time they get to the footer. Some WordPress Themes don’t even show a footer. Or they emulate the Hemingway WordPress Theme and put all the navigation links in columns in the bottom, turning the footer area into the sidebar. I think it’s time we took back our WordPress Theme footers and gave them the attention and respect they deserve. The footer in a web design is the bottom of the page. It indicates the end of the page. The footer includes navigational links to move the reader into your blog’s content, but it does so much more. It’s the last thing some visitors see after they finish reading your blog post and comments. When you scroll down past all the content and comments, there lies the footer. Shouldn’t it be helpful? Shouldn’t it invite the visitor to dig deeper? To move around and find more information? Shouldn’t it give them one last taste of who you are and what you blog about? In the early days of web design, the footer was the placeholder for links to the About, Contact, Copyright, and other information that helped the visitor learn more about the site. Like business stationery featuring the address and phone number at the bottom of the sheet of paper, the footer provided critical contact information. Somewhere alone the line, the footer became forgotten or overlooked. What should be in your footer? Should you have a repeat of your WordPress Page links like About, Contact, Copyright, Policies, and other links? Should you have a list of your primary categories? Since it’s the last thing many readers see at the bottom of your blog post, what could you put in your footer to encourage the visitor to stay a little longer or learn more about you and your blog? and <a href="feed:<?php bloginfo('comments_rss2_url'); ?>">Comments (RSS)</a>. Some of the rest of the “hidden” bits of information in the footer are optional and there to help you if you need them for troubleshooting. Within the comment code (<!- - text here - ->) is link and text that does not appear on your blog unless you choose to have it show by removing the comment code. Removing the comment code would display the credit line to Michael Heilemann and a link to the Kubrick site, if you want to give credit where credit is deserved for the Theme. Inside of the /* text here */ in the PHP code that says “Just what do you think you’re doing here, Dave?” is also a comment and doesn’t show, unless you remove those slash astericks. This is a little inside joke as the Theme is called Kubrick, after Stanley Kubrick, the director of the movie, Space Oddysey 2001. Another bit of code hidden within comments is a PHP query used to test the number of database queries needed for each page load. This is a commonly used testing device and doesn’t show on your WordPress blog. If it’s in your Theme’s footer, consider leaving it there. For now, we’re going to ignore it. At the bottom is a call to the wp_footer() which is used by WordPress Plugins as part of the Plugin API Hooks to help run the Plugin and actions that take place at the end of the page’s loading. Did you know all these things were happening behind the scenes within your blog’s footer? They are, but we’re going to deal with what the user sees when they reach your blog’s header. In tomorrow’s article, I’ll cover Customizing Your WordPress Theme Footer. This entry was written by Lorelle VanFossen and posted on September 29, 2007 at 5:18 am and filed under Web Design, WordPress, WordPress Themes, WordPress Tips with tags how to use wordpress, Web Design, wordpress, wordpress help, WordPress Themes, WordPress Tips, wordpress tutorials. Bookmark the permalink. Follow any comments here with the RSS feed for this post. Post a comment or leave a trackback: Trackback URL. So what SHOULD we put in our footers? The Hemingway stuff? The page listing? Categories? A hint: anything you want. But what best serves the reader’s needs is always best. By the way, before anyone jumps in and says it, the Hemingway “footer” is really a “sidebar” that is placed above the footer. There is a practically non-existent footer in the Hemingway Theme. I’m busy hacking up my footer on sciencebase.com as we speak…Just added a cluster of chiclets to my Facebook, Pownce, and Twitter pages I’d like to give it a blue background and make all the text white, but I’d also like to make it four columns and include pop posts and my rss chiclets in separate columns too. Is there any way to do that quickly and easily, is there, essentially, a way to widgetize a footer without interfering with the sidebar? As far as I know, Sidebar Widgets are still restricted to the sidebar, though they shouldn’t be. As for how to change your footer’s colors and such, I’ve address this in the article, but it isn’t done “quickly”. Just change the CSS to what you want and experiment to get it right. I like the footer to tell my visitors about my copy writing issues. But if I use free theme can I delete footer with links to author? If the design author allows it in their copyright and GPL license. Still, it’s a nice thing to give credit where credit is due and people judge you by such credit. I think I’ve figured out a workaround. The thing to do would be to create a second sidebar but then use CSS to force it to the bottom of the page and then disable the actual footer. That’s a backwards way to do it. The best thing would still be to fix your footer rather than fight CSS with a sidebar, but all are containers with different names. You can call them fred and wilma and they will still be a footer and sidebar. 😀 Glad you figured out how to resolve the issue. You might consider now changing your second sidebar name to footer (and change it all through your stylesheet, too. Search and replace simple.) so you won’t be confused with what that is a year from now when you decide to mess with things again. Great, many of us not concern about this part, obviously, we can get lot of benefits by optimizing the footer. I think it’s a good idea to give enough information at this part, because the visitors will see it after scrolling the pages and they will dig more information from the footer. It’s just like a sidebar and we should behave it just like a sidebar, that’s why many themes out there have a few sections at the footer area. Thank you for putting together such a great site for people who are just learning how this whole world of wordpress works. For my footer, I would like to add an image above the credit section and am having trouble figuring out how to make it work. I am using the Magicblue theme. Would anyone be able to lend some assistance? Have you contacted the Theme author or checked their site for documentation and information on how to customize it? There are a lot of ways to customize the footer to include an image. Since I’m not familiar with that Theme, ask the author or check in with the WordPress Support Forums. Thanks for this great blog post. 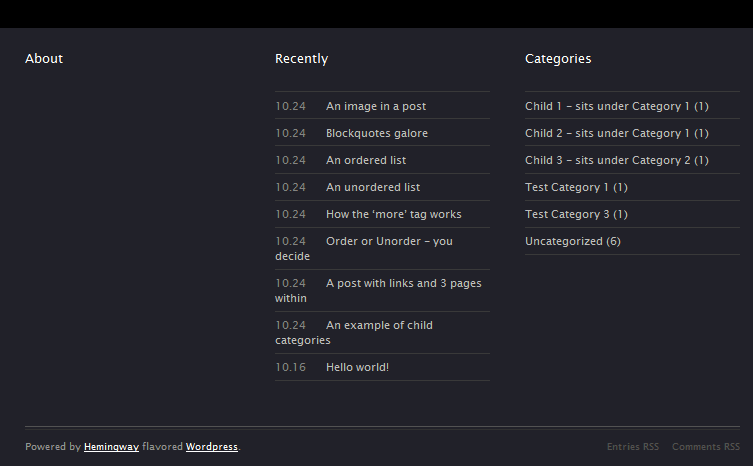 Some themes like Thesis these days allow editing without touching code which is really great. I am using Arjuna, and I don’t see anything about footers. Can you help me with my footer information? I really appreciate it. WordPress.com Themes cannot be edited nor changed, except where allowed in the Theme custom features. You can change the Theme by buying the CSS Extra and customizing the look of your site. This is a pretty old post… but it still is getting some love… Why not put a “back to top of page”, link in the footer? Nobody does that and it seems like it would be useful. That’s a good idea. You can put anything in the footer. I like it. Go for it! At the bottom in the footer you could add a link to return the people to the top of the page, though it would be tricky as comments and a lot of other stuff might get in the way and it wouldn’t be a clear “back to the top of the page” link. So get creative in your layout and design. It could be a button or text or whatever you want to indicate the function of the link. hi, i am new to wordpress, trying to figure the way around, and googled to this blog – which seems to be the best on the subject – could you please help me, i am missing something: there are header settings in wp, i can change an image, to specify other parameters – it is under appearance / header, so in my simplicity i would expect to find appearance / footer – how come this is not the case?! is the only way to change the footer to change the code in php file?! not that i mind some php, but still probably i am missing something? The footer is not widgetized nor an option for most WordPress Themes, but some do have that option. Most people ignore the footer, hence the article. The only way to change the footer is in the footer template file of the Theme. I still get confused sometimes.. Should the footer be used to display things or hide them? Confused? You think that hiding anything on a web page is a good idea? I have to admit that I haven’t been giving my footer much love. Great article. please I do not know how to customized my theme footer to mine,am using online marketer theme please help me. Please contact the Theme author or ask for help on the WordPress Support Forum. They may be able to help you if you cannot understand the instructions in this article. Thanks.